According to Indian police, the death toll following the derailment of a train in Uttar Pradesh state has reached at least 115, with more than 150 injured. 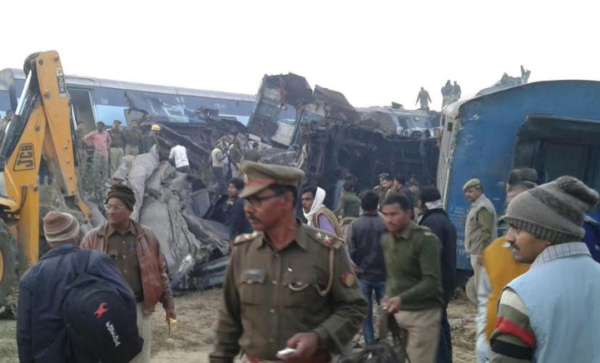 Fourteen carriages of the Indore-Patna Express derailed just after 03:00 local time on November 20, near the city of Kanpur. The Times of India quoted sources as saying a fracture in the track could have been to blame. The death toll has been rising steadily all day and is expected to increase further. By late afternoon, rescue workers were still using heavy machinery to try to reach survivors. The prime minister said he had spoken to Railways Minister Suresh Prabhu, who was “personally monitoring the situation closely”. Home Minister Rajnath Singh said that India’s National Disaster Response Force was overseeing the rescue efforts. Kanpur is a major railway junction and hundreds of trains pass through it every day. Train accidents are fairly common in India, where much of the railway equipment is out of date. An accident in Uttar Pradesh in March 2015 killed 39 people and injured 150. In 2015, the government announced investments of $137 billion over five years to modernize and expand the railways.